"Have a nice day son. "Jenna nuzzled Kodi than turned to Balto. "You mean Saba isn't enough old? "She asked. Aleu smiled. "I see. "She said, but she didn't belive in Dingo. Balto waited to here from Nobu and see what he wanted to do. Nobu stared at Balto and Saba,he didn't know what to say,he remained in silence until his stomach growled. "I'm sorry for that,I have been several days without food.What do you usually hunt to eat in here?" Aleu wantzed to say somethinf but Dingo was already went from there. "Never mind. "She siad. Jenna sighed. "I think she is already ready. 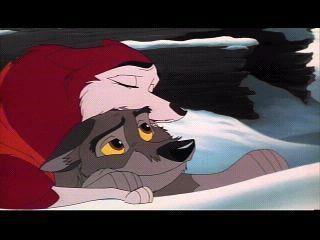 "She turned to Balto. Balto said Yes Thats a good Idea And you would Like the food there Nobu. Really do not apologize I know you are knew and nervous bu you do not have to feel alone we are here for you BAlto said Encoraging Nobu to fit in. "The butcher's shop?...I guess that would be nice..."- Nobu smiled, but he didn't really know what the butcher's shop was, but he was starving and if they said there was food in there, he wouldn't disagree to go.He felt strange being with so many dogs, he didn't even remembered being with that many wolves, he had a lonely past with his mom and he was not used to be with many animals, but even though he liked being with Balto's family, he was really looking forward for some time alone with Saba. Jenna smield. "I think it could be a great love. "She said. Great Mind if we tag along Kodi said feeling hungry again. All roght Boys join the group and Balto continued to Lead to the butcher shop. Aleu heard Kodi.She giggled ans walked next to Kodi. "Well, why dont you tell her? "She asked and smiled. Jenna smiled, because she heard Kodi two. Kodi blushed Ok I will do that He said. He got embaraessed when alue Heard him he wanted it to be private. Kodi emanwhile was thinking How he was going to tell Dusty about how he felt without feeling Dumb about it. "You showed me when I was a pup. "Aleu smiled. "Just wait here. "She jumped out and smoe minutes later she arrived with a lot of meat. "She put them down. "Here I am. "She smiled. Jenna laughted. "MY daugter. "She nuzzled Aleu. Balto said Thanks Alue now lets bring this to the boat to eat so its safe and No human will get mad at us.